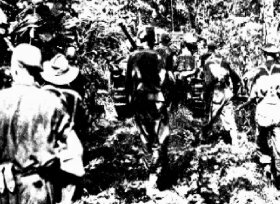 When the Australians under Lieut-General Savige, GOC Second Corps including the AMF (Australian Military Forces) 3 Division and 11Bde & AIF 23 Bde operating in Bougainville and adjacent islands, assumed responsibilities for the Torokina coastal confines the Americans had repulsed two large-scale Japanese counter-attacks. The Japanese commander of the 17Army, Lieut-General Kanda, withdrew his remaining combatants from the American perimeter concentrating them in the south near the garden grown food resources. 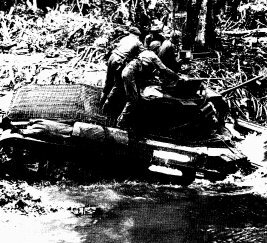 On the 24 January 1945 the 25Btn relieved the 47Btn on the coastal Tevara River entrance then set off down the west coast of Bougainville and by 3 February a platoon had invested the shoreline village of Toko. That same day another platoon landed from a barge and the combined force carried the patch of ground at the point of a bayonet forcing the overwhelmed elements of the Japanese 13 Regiment to withdraw. The 15BG insertion at Toko established a base for a new axis of advance to the Hongari and Hari Rivers and to cut the Japanese supply line of the Buin Road the main track on the whole island into Empress Augusta Bay. At 9am on Thursday 29 March 1945 at Toko, and again on Good Friday, advance tanks of ‘B Squadron 2/4AR went ashore from LCT’s (Landing Craft Tank) with Maj Arnott in command and Brig Field ordered the armoured unit to the Puriata River to support the operations now active across to the Buin Road. The manoeuvre was also a chance to demonstrate the effectiveness of employing tanks with forward infantry companies and protection for the line of communications. The following morning 15FldCo engineers, helped by clerks, cooks and other employable locals began improving the three-ton bridge at Combes Crossing and by 2.30pm the 24ton tanks began moving. In the meantime the Puriata River had flash flooded and was too high for the Matildas to ford, there the crews got to work and in half the time prescribed had waterproofed the tanks with canvas and grease. The first tank bogged in the stream, the other three crossed with the aid of a towrope connected to two tracked conventional bulldozers and the Matildas were able to move up behind the 25Btn location at Slater’s Knoll. The element of surprise was essential and it was inadvisable to mention the word tank on the unsecured telephone line, so it was asked if "Arnott’s biscuits" had arrived and the reply was they have. Next morning the Matilda’s escorted by infantry, engineers and a bulldozer to improve the track set-off to break the Japanese counter-attack that had invested three companies, and were holding out. In the perimeter the hard-pressed Diggers heard the tank engines roar above the sound of firing weapons as the Japanese launched a last desperate banzai attack. The Matildas rolled forward until 400yards from the area of action, then advancing to the attack went churning down the road with all guns blazing, thrashing the thick vegetation with automatic Besa machine-gun fire and piercing foxholes with quick-fire 2pdr solid shot. 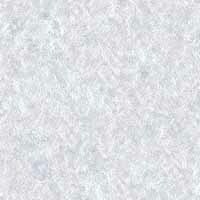 The enemy broke into the open and were cut down by the infantry support as they fled. Here the tank force split, a couple of Matildas escorted the wounded back to Slater’s Knoll and the others advanced with B’Company to its old position to recover the heavy equipment. The Japanese ambushed the wounded column but with the timely arrival of the second tank force returning beat back the Japanese attack. The enemy had shown his hand and the order for barbed wire was rushed through with an additional supply air-drop arranged and the Australians dug in. The defenders did not have to wait long for on the 5 April the Japanese struck in force. Buin Road splits Slater’s Knoll left of centre that is hard up against the west bank bend of the Puriata River. The Japanese for an hour and a half swept up in waves to within yards of the Digger’s forward gun-pits even though the diversionary western flank attack had failed before the main assault developed. The enemy was pinned by 25pdrs that joined in while the Japanese could be heard entrenching along the gully. All morning the boom of mortar bombs and grenades criss-crossed the barbed wire front-line, sporadic banzai attacks were broken up and the wounded evacuated. A little after midday two Matildas moved through to the forward line of the battle to assist the infantry that had now begun to mop up and the small stubborn enemy parties that broke cover as the Infantry tanks drew near were mowed down by automatic weapon fire. The Puriata Line had been held and after four months of fighting the enemy, and the elements, the weary 7Bde was relieved by the 15Bde under Brig Hammer and his brigade were set the task of clearing the Japanese to the Hari River. He also gladly accepted ‘U’ Heavy Battery armed with 155mm Long Tom heavy artillery, they arrived by barge then after settling in joined 2/11FldRgt that had been languishing in Lae and sent across. An encircling move was planned by the commander for the advance east to the Hari River line objective, with the frontal assault along the Buin road by 58/59Btn group under Colonel Mayberry having two troops of tanks commanded by Maj Pike assisting. Simultaneously from the north in the Rumika area deployed west of the Hongari River the 57/60Btn group of about 180 soldiers, one troop of tanks and a platoon of engineers, one bulldozer and some 120 native carriers, was to thrust along the commando bush road through the jungle to the east then cut south in a wide arc onto the enemy’s line of retreat. Still further north an armoured patrol group known as Scott Force which is to advance the direction of Kingori to give northern flank protection. In one action the bulldozer clearing a tributary path had to be abandoned when it bogged drawing a hail of bullets, but with supporting artillery and Corporal Burns’ Matilda advanced to cover the wounded around the bulldozer, which was hooked up and brought to safety. The armoured vehicle crew and those infantry that could be spared often had to corduroy the saturated track with logs before the tank could move through. Another time a concealed Japanese field gun opened fire down the track at the leading tank of Corporal Matheson but the combined return tank salvo promptly silenced it. Unbalanced by these thrusts the Japanese were outflanked and his defences collapsed, with a spectacular advance the Diggers crossed the Hari river, which the enemy had every intention to hold, and arrived on the Ogorata River to within striking distance of the next river the Mobai. In May 1945 the Australians at Bougainville received the HQ and an additional squadron of the 2/4AR. For the first time the bridge laying scissors tank Covenantor Bridgelayer was employed and the Tomoi River was crossed. Also timed concentrations of artillery fire caused disruption amongst the enemy on the receiving end, so defended positions were taken with minimum casualties although ammunition expenditure rose steadily. 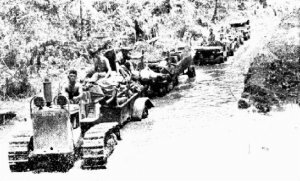 While the two forward artillery regiments had met the needs of successfully supporting one brigade, the third field regiment was needed to provide relief for those battling over the dense jungle under the extreme equatorial conditions. By June the troops of 15BG had pushed south east onto the Miva River approaching towards Buin and were relieved by Brig Simpson’s fresh AIF 29Bde. The heavy weight Matilda Mk2’s were used to plough tracks through the thick terrain for the leg patrols but on occasions were badly damaged by being blown up by layed mines hidden beneath the foliage. The enemy even brought forward a 150mm gun and at a range of 350yards hit the leading tank killing the driver Trooper Dew and wounding the rest, the tank was hit twice more and destroyed. The Japanese were starting to improvise anti-tank measures against the threat of thick armoured fighting vehicles. In the operations to the north of the island on the 23 July the 8Btn of the 23Bde under Brigadier Potts attacked Commo Ridge where the Japanese seemed to be establishing themselves strongly. After bombardment by the First Marine Air Wing and RNZAF Corsairs, Capt Reed’s company moved off from the start line with two Matilda tanks belonging to Lieut Scott’s armoured patrol, which had been transferred to this sector early in July. As the joint force got closer to the enemy position one Matilda became stuck, the other had halted on soft swampy ground, nevertheless the tanks were able to give covering cannonade fire in support of the infantry attack and the ridge was taken in twenty minutes. In the same sector on 2 August the lead tank of a 27Btn two company strong patrol along the Ruri Bay track tripped a mine made from a 500lb ariel bomb, killing three of the crew and wounded eight infantrymen. Lieut-General Savige forbade the using of heavily armoured cumbersome Infantry tanks on jungle patrol and be only employed with troops assaulting enemy positions that have been fully investigated. During July only 26 days were wet with 2173 points of rain falling and both sides settled to deep offensive foot patrols with continued Allied ariel superiority until the end of the war.